So…you want to make a Paella? Finally, I thought it was about time I put pen to paper (or fingers to keyboard) for this classic recipe. I went to a local expert, he´s called “Chef Colorin” and he makes the paellas for all the local fiestas. Be warned, there are LOADS of photos in this post, but I hope you enjoy seeing the process. Of course, he wasn´t going to just sit down with me over a glass of wine and give me the recipe. Much better than that, I was going to join in with the cooking. Fantastic, I thought, how many are we cooking for then Chef? Oh, not too many he told me, only 420 on Sunday. Get there about 11am he said, and we´ll show you the ropes. Not one to balk at such a challenge, and I even wore the exceedingly unflattering hat (yes, I´ll show you the photos). It was one of the hottest and windiest days we´ve had for a while, so we couldn´t even put a shelter up for shade. Hey ho, the show must go on, and of course, it did. We used 3 Paella pans which make 140 portions each. Feel free to adapt for smaller groups! The ingredients below are per 140 person pan. Start with your base stock which is made in large 50 litre pots, sheltered from the wind today with a clever little device which goes round the base of the gas ring. Into each pot goes 800g of stock cubes to 50 litres of water (at home, you´d probably use home made chicken or fish stock), 5 bay leaves, 2 tablespoons of sweet pimentón, 200cl of dry white wine, 500g each of chopped peppers and garlic, 1kg of monkfish, assorted fish bones, 400g of chopped tomato and 4 kilos of prawns with their shells on. Bring to the boil then simmer for about 20 minutes or so. Chef added 14 sachets of paella food colouring to the mix but at home we´d use saffron or turmeric. Strain out the prawns, fish etc. Then, wearing your glamorous outfit, count out 280 prawns (that´s so that everyone gets at least 2 each) and pull any meaty bits of fish off the bones. First come, first served on any extra prawns! Lookin´good Chica, and rockin´that mesh hat look! Is your fire ready to cook? I hope so, we´re going to begin. Heat 3 litres of olive oil in your pan and add 8 kilos of chopped pork and season with salt to taste. Fry gently for a few minutes. Now add a couple of heaped tablespoons of sweet pimentón. Next comes a kilo each of red and green peppers and 250g of chopped garlic. Don´t forget the seafood – 2 kilos of chopped squid. Stir gently while making silly faces. Big Man has a go wearing the “Sherry Server” hat from Jerez! Time to add 4 kilos of chopped tomatoes and a kilo of sliced roasted peppers. Open the bags of rice carefully – 14kg for 140 people, which translates to 100g per person at home. Such concentration – I take my work very seriously! Stir gently into the sofrito with your giant paddle. Now add30 litres of stock (which is 2 litres of stock per kilo of rice, plus a little extra – at home you would add 200cl plus a dash per 100g of rice…see, not so complicated!). Keep that rice moving without burning your legs on the fire underneath the pan. It´s much harder than it looks! (And don´t forget to taste). Remove from the heat and sprinkle over those prawns and the fish you set aside. Was he trying to sneak one of my carefully counted prawns?! Phew, job done. Time to show off an enormous loaf of bread baked by a local baker. While we´re eating, you can enjoy a vaguely arty shot of a clean paella pan (don´t forget to oil it after washing up). PS. Am off to London tomorrow for a week so will try to keep up with all your lovely blogs and comments, but apologies if some have to wait until after 20th June. Hope you enjoyed the paella making as much as I did, sorry it was so long but I really enjoyed putting it together. I do have to admit though, I was quite glad to take my “uniform” off and sit down in the shade of an olive tree with a large glass of tinto de verano. Ready to wing their way to the UK! Yes, it´s back to jam again today. You may, or may not, recall that a nearby village is famed for its cherries. We had a very, very long and wet winter which meant that a lot of the blossom this year was lost from the cherry trees. Such a shame for those whose livelihoods depends greatly on selling their crop, a shame for the cherry fiesta which is coming up next weekend, and a shame for all the customers who were hoping for a bumper crop. We were very lucky in that a friend gave us a kilo the other day. 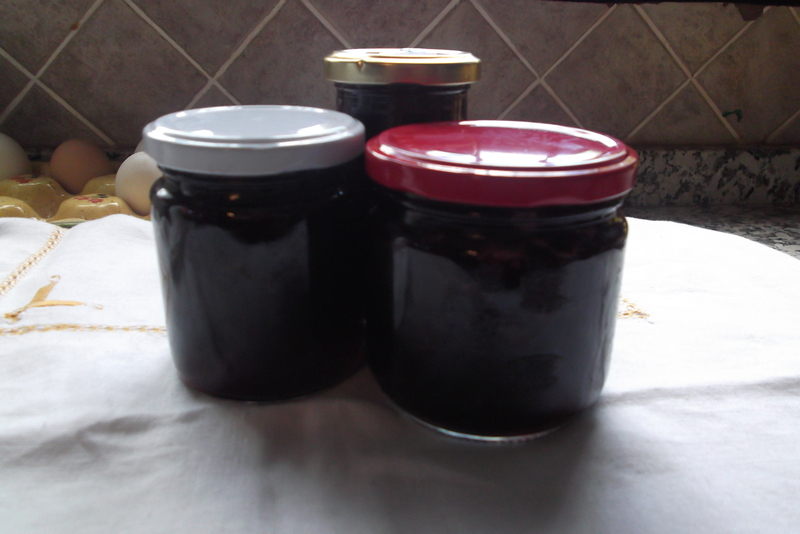 We tried a few and they were delicious, but I wanted to make my first cherries into jam, to capture a special moment at the start of summer. Cherries are quite hard to get to set (at least, these were! ), so in this jam I used a sachet of pectin powder, the setting agent which occurs naturally in some fruit like apples and citrus fruits. If you can´t get hold of it (or the liquid pectin) don´t worry, a little grated apple or the pith of a lemon plus a few minutes extra boiling should do the trick. After pitting the cherries (that´s a messy job!) I ended up with 600g of fruit to which I added 400g of sugar and the juice of 2 lemons. Feel free to vary these quantities a little if you like your jam less tart and more sugary. Keep it bubbling away for about 10 minutes. Don´t get distracted or walk away! If you have a jam thermometer, do use it, it saves having to reboil the jam later if it doesn´t set. Otherwise you can drop a spoonful of jam onto a saucer which you have previously placed in the freezer. When the jam cools on the saucer you push it slightly – if it wrinkles, it´s at setting point. If not, boil a little longer then repeat. Leave the jam to cool down a little for 5-10 minutes so that when you pour it into still warm, sterilized jars (I run mine through the dishwasher to do this), the fruit will not float to the top. Seal the jars while they are still hot and this will keep for at least a year. It´s delicious on bread but also fantastic on ice cream, especially if you warm it a little first. Sorry, I only took a photo of it in the jars, and they are already earmarked to wing their way back to the UK with my friends! Luckily Big Man came home with several cartons of cherries this morning, so tomorrow I´ll be busy stoning cherries again for the next batch. There I was, back in Spain again. I had settled dangerously quickly back into my life as a Cortijera (or country woman). Visitors were coming and going once more. That awful necessity called work was now a distant memory and no thought was currently being given as to what would happen next. Well, apart from getting the provisions in, topping up the tan and the water level in the pool, and working on the ever so slightly less rusty Spanish. Periana, my local village, was gearing up for something big. I had gone into the village for water and provisions and was having a bit of a mooch around. Actually, there’s not too much to do in Periana usually so I was doing all this very slowly. It was very hot too, and sudden rapid movements in the height of summer in Andalucía are generally not advisable. After a few attempts at getting through the narrow streets in the car, requiring me to reverse a fairly long way not once, not twice, but three times to let people down the road, I eventually managed to get through the village and to park. It still freaked me out, but I was starting to get used to the scary Spanish driving style I needed to adopt to fit in with the locals. Everything looked different. The narrow streets in the centre had been draped with awning – presumably to protect the fair people of Periana from the heat and not the rain. The whole place was buzzing as trucks and stalls were manoeuvring around the main street and vying for prime positions in order to sell their goods and entice people to shoot a moving plastic duck for the chance of winning a fluffy toy. Clearly great things were about to happen a few evenings later. They were. La Feria de Agosto de Periana. Dolores felt that it was time for me to join in with the local celebrations. After all, I was now a “frequent visitor”, and Ria was staying therefore it was necessary to provide entertainment to all honoured guests. Arrangements were made to meet at the “best” restaurant in town – El Verdugo – on the big night. Dolores and Paco were providing the transport and we were meeting our English Chums Jenny and Malcolm (or Hennifer y Marco as they are known here) at 9.30 for dinner to be followed by much merriment and dancing. It’s a bit of a hairy drive from the Cortijo to Periana as it’s a single track, very twisty and unsurfaced road all the way. If you meet another car you both have to squeeze past each other and hope that one of the cars does not end up sliding down into the olive groved valley below. A night out with the gang in a convoy of cars earlier that summer led to an interesting on road encounter. It was about 11:30pm and it was very dark. We needed to drive up the hill to Periana and out the other side. Paco was driving exceptionally slowly – I’m not sure if this was for my benefit, being a “foreign woman driver” and following him – with a couple of pauses to let people by or to squeeze by ourselves. There are unwritten Spanish Rules of the Road , it was pitch dark, the road is one lane wide (and I use the word “road” very loosely here), and there is a sheer drop down the valley on the other side. I’m sure you get the picture. At one point just outside Periana, Paco stopped again and then just didn’t seem to move. We could see the other car which has been coming towards us and that didn’t seem to be moving either. Dolores started to rant a bit and blamed Paco for blocking the road and started bipping the horn. My horn, mind you, she was in my car with me to provide entertainment and in-journey commentary. Paco then got out of his car and Dolores started screaming about the possibility of Paco being assaulted by bandits. There then followed a bit of a heated debate, a lot of hand waving – Paco’s – and eventually the other car backed up. We slowly manoeuvred around it and as we started to pull past the other car, Dolores started making “very relieved” noises. She told me that she now understood why there had been a delay and that there was no need to worry. The reason the other car had had problems was because the driver was blind. “Yes” she told me, “the old guy in the car has terrible cataracts and the operation to fix them didn’t work so he only goes out in his car at night now as he can see the headlights of the other cars”. Well, that was alright then. Anyway, there we were on our way to the Fiesta. Everyone was scrubbed up and wearing their glad rags and Paco insisted on parking practically on the main stage, so that we would be close to where the action was going to take place. The restaurant was crowded but Dolores soon started shifting tables and chairs and we ordered some wine while we awaited the arrival of Henny and Marco. Ria and I caused a little consternation by asking for wine and a bottle of water – not tinto de verano which is red wine and lemonade. Drinking red wine alone is considered kind of “fast” around here, but apparently also having a glass of water with the wine was a sure fire way of causing terrible stomach ache. We decided to run the risk despite Dolores’ warnings. Concern started to grow for our fellow Brits when 9:30 then 10:00 came and went. Are the British not well known for their punctuality? Clearly something terrible had happened and we all ought to be seriously worried. Eventually a call came from Hennifer which only served to concern the group more – an emergency had arisen but they would be with us shortly. Eventually we decided to order food and around 11:00pm they arrived. What could it possibly have been that had delayed them – death, illness, car trouble? No, it was sewage. Vast quantities apparently, coming the wrong way out of a toilet. Fortunately Fermin the only plumber in Periana was lurking around the restaurant and his services were secured for the next day. Particularly amazing as it would be the morning after the Fiesta, and a Sunday too. Conversation turned to the single status of Maria and Ria and Paco wanted to know what sort of man they should be looking out for me. “Well, “I told them “a few days previously when I ventured into Periana I passed a most good looking man in the street. He was tall, good looking, grey haired and a policeman.” Not sure what it is about me, but clearly I have a secret penchant for men in uniform – I have decided not to fight it. Dolores was pleased to have something to work with and dinner resumed. Meanwhile, another subplot was unravelling at the bar. Dolores started to do her “secret” sign. This involved winking very indiscreetly, pointing at her eye and jerking her head in the direction in which you are supposed to look. All very melodramatic and something which I took to doing when talking to her in imitation. Fortunately Dolores thought that I had just picked up an Andalucían gesture and did not realise that I was gently taking the mickey. Which only caused us both to do this even more. While we were both jabbing ourselves in the eye and winking like demented perverts I gathered that we were supposed to be looking at two of the many men at the bar. One of them was believed to be a “friend” of Hennifer and Malcolm (although I later found out that he was no friend of theirs) and a highly suspect individual in Dolores’ eyes. Dolores had taken against him because he had a reputation for entertaining a succession of women in his house and made frequent trips to Morocco. Clearly a Drugs Baron. She seemed to think that he and his friend (an artist, we were told) had been told by Henny that Ria and I would be there and were lurking in the hope of an introduction. She was right. Dolores was quite correct in her character assessment – I didn’t have any proof about the drug running but the man was clearly an idiot. Drinking his Sol y Sombra (brandy and Anis) he was trying to look like a local and to impress Ria and I with the fact that he and his friends were both artists. The word Piss sprang to mind. When we eventually established that he was a failed Fleet Street photographer who hadn’t worked since 1987 (and who knows what “art” he dodgy mate specialised in) we made it clear to them that we were very under whelmed and they ambled off in search of younger, firmer flesh. Dolores quickly resumed they eye jabbing, winking manoeuvre which was her sign that something interesting was up. I assumed this was to indicate relief in the departure of the suspected Drugs Baron and realised far too late that this was because the police had walked into the restaurant. Two Policia Local (blue uniform) and two Guardia Civil (green uniform). Of course, one of them (blue) was tall, good looking and grey haired. I quickly began to regret my earlier revelations, and with good cause. Very concerned that the object of the attention of the whole of our table was unknown to anyone (including Dolores who knows all but about 3 people in Periana and they, quite frankly, are probably not worth knowing), Dolores summoned him over. Although he was on his way for his dinner, Dolores is not someone who can be ignored and she soon established that his name was Cristobal Colon, which I believe translates into something like Christopher Columbus, so make of that what you will, he lived outside of Periana (aha, that’s why he was an “unknown”) but marital status was, frustratingly, unknown. The wine flowed, the water less quickly, and a good time was being had by all. Dolores was “working” the room and soon Ria and I were dragged forcibly from our chairs, which was quite a relief in all honesty as they were wooden affairs which looked as though they were used for witch ducking and were incredibly uncomfortable. Unwittingly, like lambs to the slaughter, we followed her to the back of the restaurant where the four policemen were trying to eat their meal. I have to say, there are no curly sandwiches and cups of cold tea for the Spanish police. Plates of deep fried fish, casseroled loin of pork, salad and a huge jug of tinto de verano were all laid out on the table. “Ladies,” she said, “I want to introduce you to my very good friends.” And, despite the fact that she had only met one of them about 10 minutes previously, she proceeded to do exactly that. She added, in with our names, the fact that we were both “soltera”. Sad, single, middle- aged women in other words. Ria was trying to make a break for the toilets but Dolores had a firm grip on her wrist and there was no way to escape short of dragging Dolores with her. They had been told that I spoke Spanish so I tried to make a joke about drinking on the job, which clearly went right over their heads. Cringe, cringe, cringe. Gorgeous Cris (as we will call him from now on) was still giving nothing away about the wife and family he probably has tucked away, far from the prying eyes of the Perianans. I thought the embarrassment factor had reached its optimum level as we walked away, but no – there was still more to come. As I went up to the bar to pay my share of the bill, I was grabbed by the formidable Dolores once more, only to be faced with Cris writing out the phone number of the police station for me in his little notebook. He told me, rather unwillingly it seemed, that Dolores had thought it would be a good idea for me to have it in case of “trouble”. Bear in mind that people in Periana generally don’t lock their doors, let alone their cars, this was a highly unfeasible possibility. I thanked him politely and said that I thought trouble was probably unlikely to happen in my neck of the woods. He agreed, but promised Dolores, reluctantly, to keep an eye on things. And that was it. Well, apart from the police standing behind us during the dancing and merriment part of the evening (drinking tinto de verano of course) and Dolores going into overdrive with the winking and jabbing. Unbelievably, or perhaps fortunately, I never saw the man himself again. His colleagues, of course, I bumped into several times. They all said hello to me but it was not clear if this was out of pity, politeness or fear. I did consider calling the police but was not sure if the loss of my voice, memory or car keys would constitute a genuine emergency around these parts. God bless the boys in blue!